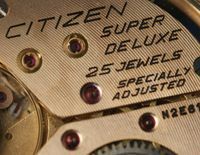 Citizen 52-0110 Diver – Blue Bezel Insert…or Faded Black? I’m interested to know what other people think – is this a blue bezel insert, or is it faded black? 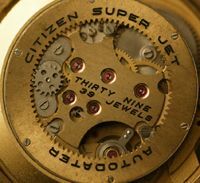 Bert noted that his is from 1977, as is the one shown via a link in the diver article. What do you think? 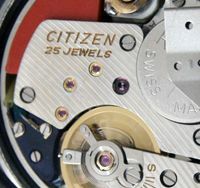 This entry was posted in Vintage Watches and tagged Citizen 52-0110, Vintage Citizen Diver, Vintage Citizen Watches. Bookmark the permalink. 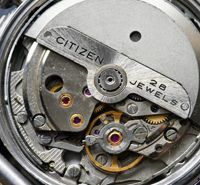 4 Responses to Citizen 52-0110 Diver – Blue Bezel Insert…or Faded Black? I would have thought a simple way to determine the colour would be to pop the insert out and see if the back is blue as well. My bet would be it’s the original black. Hi Nick – yep that sounds like a plan. Now, will Bert be happy to get the bezel off???? 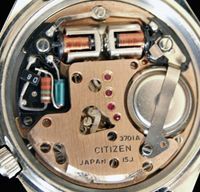 Thanks Bert, good of you to take your watch apart, not everyone would be happy to do that! And thanks for the pics, now published in a new post.